On a trip to the Geneva Motor Show I visited the Scud Ing Swiss laboratory where I saw this amazing piece of Automobile electrical equipment which would be a great advantage to Aston Martin owners of the ASM Sportshift, 1,11,111, V12 Vanquish and Vanquish S,V8 Vantage and Vantage S and the V12 Vantage and the Vantage S.
A quantum leap in relay technology, the Smart eMT F1 Relay ECU is a direct replacement of the OEM robotized gearbox hydraulic pump relay has absolutely no moving or mechanical parts and is available in 2 different versions: Basic and Advanced. With a lifetime warranty this Plug&Play pure electronic solid state electronic solution protects all EMT system components with an integrated early warning system and will greatly improve the reliability of your Aston Martin and help to prevent very expensive hydraulic system failures. None, relay fails without any warning, no pump preventive monitoring neither. The integrated complex Early Warning System permanently monitors the pump and the hydraulic system, even when the engine is stopped and the ECU is in sleep mode. None, relay generates high voltage spikes which can make even the TCU fail. Does not generate any voltage spikes and integrates full transient protection to protect also the TCU and other OEM ECUs. Very slow and getting slower over time requiring longer hydraulic pump cycles. Extremely fast, 150 micro-sec. The advanced embedded software algorithm will optimize, anticipate and shorten the hydraulic pump cycles down to 2.5 secs (only if hydraulic system is in perfect condition) (Advanced version). Limited maximum current of 30A or 50A which reduces quickly over time caused by contacts arcing. Voltage spikes are created each time the relay is released. Resistance increases over the relay contacts causing voltage drops and less pump motor torque. Can drive up to 200A during its entire lifetime and without generating any voltage spikes. Delivers during its entire lifetime the optimum current to the pump. Relay contacts resistance start to increase very quickly due to the high inrush current of frequent pump start cycles and causes the relay terminals to corrode causing even more resistance. Manages an unlimited number of pump cycles and high inrush currents without causing any resistance or voltage drops during its entire lifetime. Terminals as a consequence won't corrode. Contact points move mechanically with an electromagnetic coil and are released with a spring. Absolutely no moving or mechanical parts, 100% solid state electronic solution. Sensitive to numerous power on/off cycles will wear out the relay fast. Manages an unlimited number of power on/off cycles without wear. The ECU monitors also the frequency of pump run cycles as well as the rest time between each run cycle (Advanced version). Any unusual behavior of the hydraulic system will trigger an alert. High since an electromagnetic coil requires a lot current to operate. Very low. Sleep mode 0.22mA, Standby 8mA, Active 14mA. None, will make the pump continuously running until it burns out. High impact on the entire hydraulic system. Will force shutdown the pump if it is running longer than 30secs, protecting the pump and the entire hydraulic system. None, relay will continuously power the pump until it blows the fuse in the best case scenario. 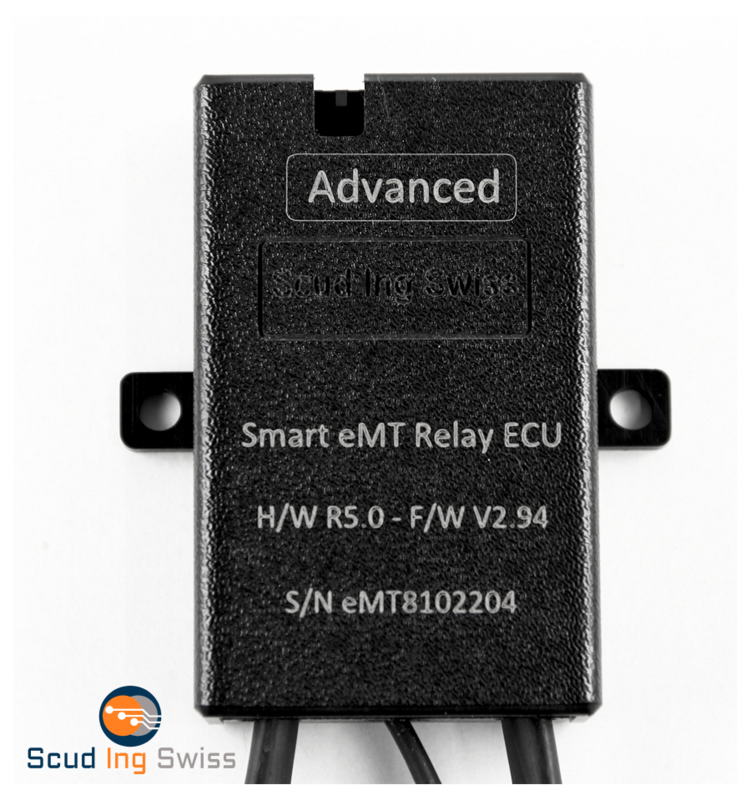 The smart current sensing system of the ECU will alert the driver if the pump starts requiring more current than usual. It will also alert if the pump drains an unusual low level of current or no current at all (Advanced version). None, will attempt to make ultra-short power on/off cycles damaging the relay and pump. Eliminates TCU requests which are shorter than 250 msecs to protect the pump. None, driver isn’t aware when, how long and how frequent the pump is activated. The ECU informs the driver each time the pump is activated including any alerts (Advanced version). With a failing relay, costs can be very high as the pump can burn out and may destroy the entire hydraulic system. Risk of TCU damage. None, the ECU protects all the components of the EMT system from the TCU up to the hydraulic actuator. The Early Warning System will even inform the driver of upcoming hydraulic issues. Yes. User can customize his preferences (Advanced version). Very low, requires very frequent changes but as a dump device, it will never protect the hydraulic system. Very reliable, once installed the ECU will last for ever. The ECU stores diagnostics data and detailed hydraulic system faults counts (Advanced version).